This all-stainless, collapsible, high output propane burner puts out 5,000 to 65,000 but/hr from low cooking settings all the way to a blast to quickly heat water. Unique folding legs collapse the unit to the size of a typical phone book for easy stowage. Canvas carry bag included. Assembled: 10"x12"x12". Made entirely of heavy gauge stainless steel, the Power Stove will support over 100 pounds of weight. The collapsible design makes it easy to store and it's super sturdy when assembled. The high-quality propane regulator lets you adjust the flame from a simmering 5,000 to a blazing 65,000 BTU/hour. 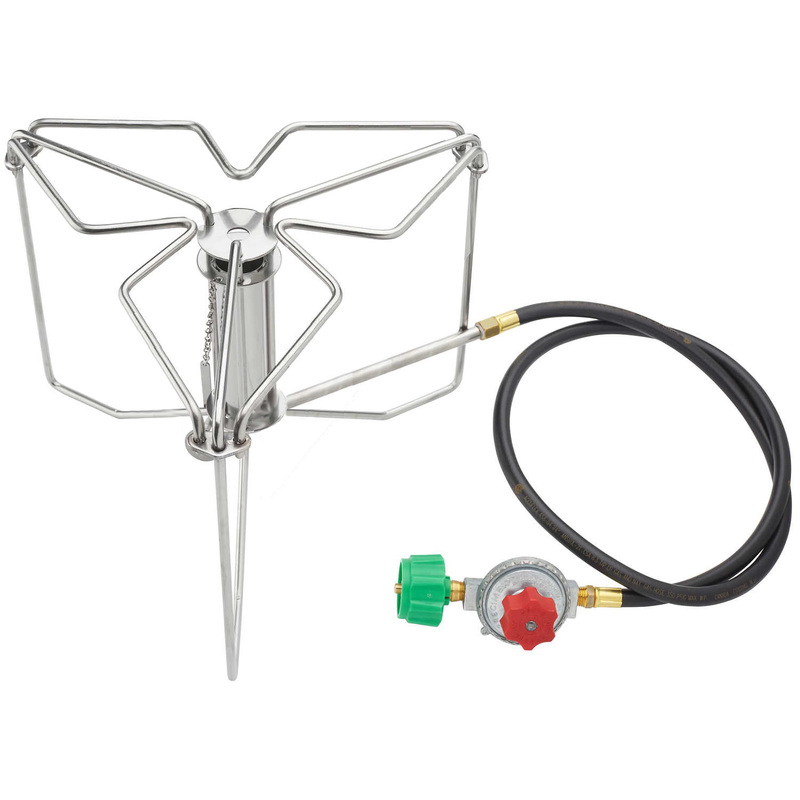 Listed regulator comes with a 48" hose and attaches to bulk propane tanks. Entire unit weighs only 5-1/2 pounds and compactly stores in your dry box or kitchen box. The unique flame spreader sits atop the burner tube to diffuse the flame for uniform heating. Comes with a set of ground stakes to firmly anchor the stove. The rugged storage case has a webbing carry handle and seals with a hook-and-loop flap. Lifetime warranty on the stainless steel parts of the stove and one-year warranty on the hose and regulator. Output: 5,000 to 65,000 B.T.U.